I wrote another book. This time it’s about building your own electronics lab, titled Building Your Own Electronics Lab. It gives the reader a gentle introduction to electricity and electronics and how to safely learn and play with them. Basic tools and components are discussed and some simple starter projects are presented. The main idea that I tried to put forward is that the electronics hobby is fun. It’s also fun to share with others. Both paperback and e-book versions are available from Amazon.com, or find it at your favorite bookseller using the ISBN 978-1430243861. Dale read the book and it is great thanks for putting my lab in there. 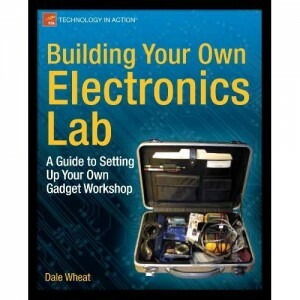 This book has a ton of good ideas on how to create an efficient lab.